The midterm elections are behind us, so we can finally move on to the 2020 contest! Just kidding. With the results of yesterday’s election, both sides are out there claiming victory and justifiably so. 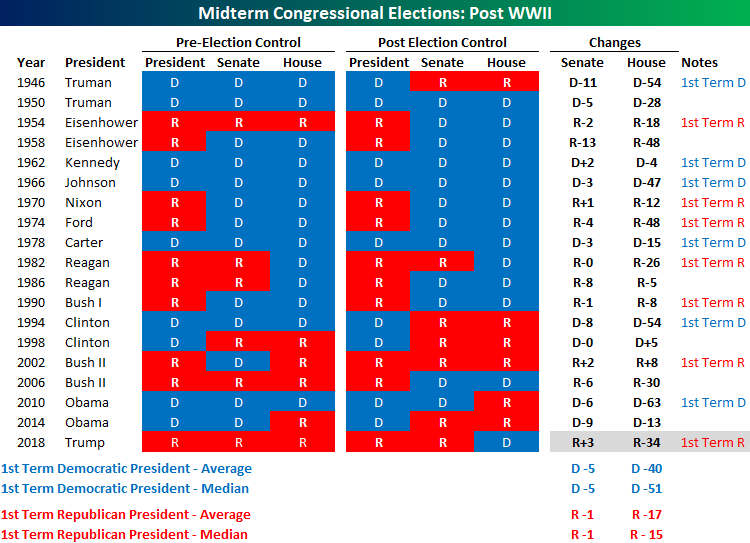 The table below breaks down the results of historical midterm elections in the post-WWII period. For each midterm, we show the political makeup in Washington before and after the election results, showing how many seats the incumbent President’s party gained or lost in each chamber of Congress. At the bottom of the table, we also include a look at the average and median swing in the balance of the Senate for Democratic Presidents as well as Republican Presidents. Based on how things stand now according to ABC News, Republicans are expected to lose 34 seats in the House and gain 3 seats in the Senate. From the perspective or Republicans, they are writing off the loss of House seats as ‘typical’ losses in a midterm, while pointing to the gain in Senate seats as a major victory and validation of the President’s policies. Democrats, on the other hand, are dismissing the weak showing in the Senate as a ‘bad map’ and hanging their hats on the pickups in the House. So which party is right? They actually both are. As shown at the bottom of the table, while the party of the incumbent President typically loses seats during the first midterm election year, Democrats usually do much worse than Republicans, losing an average of 40 seats in the House and 5 seats in the Senate. Losses for Republicans tend to be much smaller on average at 17 seats in the House and just one seat in the Senate. Based on these numbers, the results in the House yesterday for Republicans were worse than average, while the gains in the Senate were much better than average. In fact, the only midterm in the post-WWII period where the GOP lost more seats in the House during a President’s first term in office was in 1974 under President Ford right after the Watergate scandal and Nixon’s resignation. That year the GOP lost 48 House seats. Reagan’s first midterm in 1982 also saw big losses at -26, but that was still 8 better than this year. The Senate, however, is another story. With what looks like a pickup of 3 seats in the Senate, Republicans have never picked up that many seats during a Republican President’s first midterm election in office. “The Biggest Senate Pickup During a President’s First Midterm Since at Least WWII” or “The Biggest Loss of Seats in the House for a First-Term Republican President since Ford” — Which headline do you think Republicans and Democrats will latch on to?